Maureen Sebastian and Raymond Lee in Vietgone. South Coast Repertory’s world premiere of Vietgone by playwright Qui Nguyen is a highly anticipated event for us, as we’ve had the unique experience of watching this play’s metamorphosis since its inception. Qui, who hails from Brooklyn, NY, originally had tossed around the idea of writing a script about Vietnamese gangsters in Little Saigon. However, during his residency in the summer of 2013, SCR staff invited the three of us to meet with Qui and share the work we were doing in the local Vietnamese community. 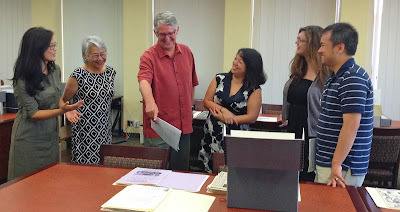 From left: Thuy Vo Dang, Christina Woo, Steve MacLeod, Tram Le, Kelly Miller and Qui Nguyen during the playwright’s first exploratory visit to the UCI libraries. He later visited the UC Irvine Libraries Southeast Asian Archive and was captivated by the photograph collection of Vietnamese refugees at Fort Chaffee, Ark., one of four military bases that served as a temporary processing center in 1975. These photographs made him reflect on the stories his parents told him growing up. Qui’s parents, along with thousands of other refugees, were both processed through Fort Chaffee after the fall of Saigon. He was inspired to write about how they met and fell in love—might we say lust—at first sight in this camp. Thus, Vietgone was born, a wickedly funny and poignant play that captures the personal journeys of a first generation Vietnamese American couple with nuance and a reimagining of the tale of refugee journeys, complete with hip hop notes woven throughout. Its tone is fresh and surprising. The cast, playwright and director of Vietgone at the post-reading “talk back” with the audience at the Vietnamese American Arts & Letters Association. 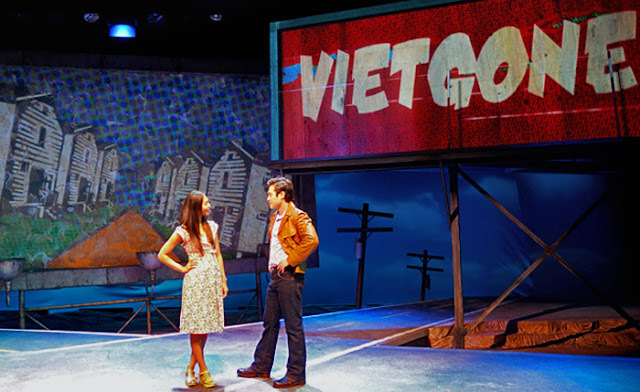 In November 2014, Vietgone’s director May Adrales and the actors presented a staged reading of the full script at the Vietnamese American Arts and Letters Association (VAALA) Center in Santa Ana to an enraptured community audience. 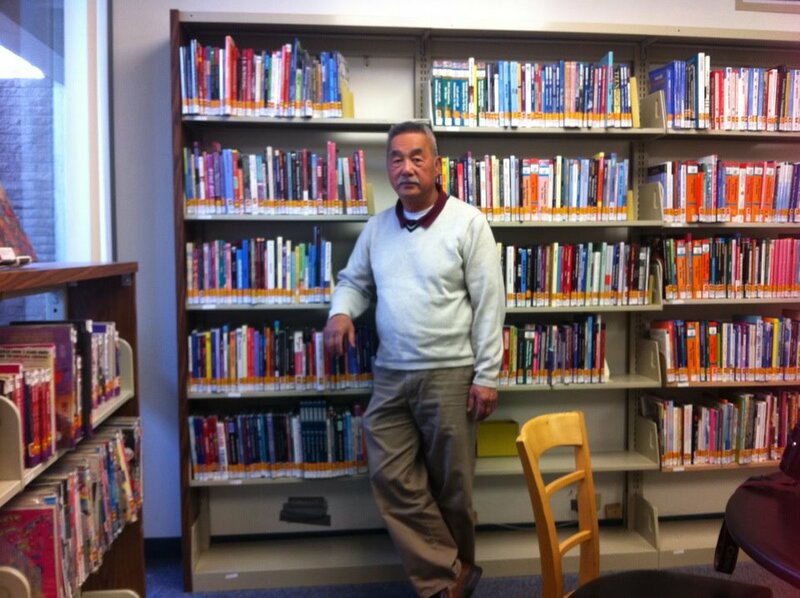 At the end of the reading, one first-generation Vietnamese American man stood up and exclaimed, “That’s my story!” because he also met his wife in a refugee processing center. 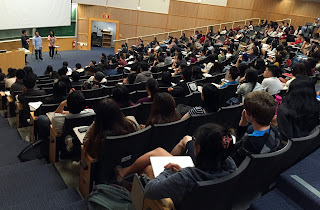 In February 2015, Qui and two cast members performed an excerpted reading from the play, followed by a lively Q&A, in Linda’s Asian American Community class with 240 students. In a follow-up survey of the event, one student wrote, “I enjoyed the Vietgone reading because it gave me a new perspective on the Vietnam War. I have only heard the American side, but I have never heard what Vietnamese people actually thought about the war.” The event, funded by the new Illuminations: A Chancellor’s Arts & Culture Initiative, encouraged students to see the connections between the historical materials in the class and artistic storytelling and gave students, many who had never attended a play, a better appreciation for the arts. The common response from students was that they wished they could see a full stage production of the play. At the front of the class, left-to-right: Raymond Lee, Qui Nguyen and Maureen Sebastian performing an excerpt reading of Vietgone in Prof. Linda Vo’s Asian American Communities class. Students shared their stories about their family’s refugee and immigrant journeys and were inspired to learn more. What’s powerful about plays like this is that it will stir conversations between generations where there is often silence, particularly about the past. Qui, with his director, actors and production team, have re-visited the archive several times to continue their research journey. Qui, the cast, and SCR staff members also visited the VIETNAMESE FOCUS: GENERATIONS OF STORIES exhibition, a partnership between OC Parks and UC Irvine, at the Old Orange County Courthouse in Santa Ana to immerse themselves in the refugees’ life stories and their journey of resettlement. This interactive art and history exhibition presents snapshots of a dynamic and vibrant community, including photographs, documents, artifacts, original artwork and oral histories from the Vietnamese American Oral History Project (VAOHP), Orange County & Southeast Asian Archive Center and private collections. Vietgone actors and creative team looking through the Fort Chaffee photographs in the UCI Libraries Special Collections reading room. Included are a diverse range of stories of how ordinary people were thrown into extraordinary circumstances because of war and its aftermath and how they were forced to make incredibly difficult choices, stories that echo Qui’s parents’ journey. The premiere of Vietgone at a major playhouse marks a historic moment for the Vietnamese community. This is highlighted by the fact that the Vietgone script, signed by Qui, May and the cast, along with a flyer of the VAALA reading, is featured in the arts and culture display case in the exhibition. 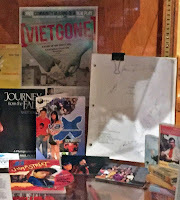 Vietgone flyer and original script signed by Qui and cast on display at the VIETNAMESE FOCUS exhibition. Qui’s parents’ story is unique and yet very similar to many of the hundreds of thousands of Vietnamese refugees coming to the U.S. However, aside from oral history archives such as VAOHP, so few stories from those who witnessed these experiences first hand are recorded. Instead, what most people read in history books and see in the media tends to be a narrow point of view, oftentimes from the American perspective that excludes Vietnamese voices who had to endure a civil war in their country and were forced to flee and rebuild their lives in America. They are not just victims of the war or history; plays like Vietgone show the humanity of the Vietnamese people. Vietgone’s journey from script to stage has been decades in the making and reflects a remarkable moment for cultural production in Orange County. We look forward to its full run at South Coast Repertory, Oct. 4-25. 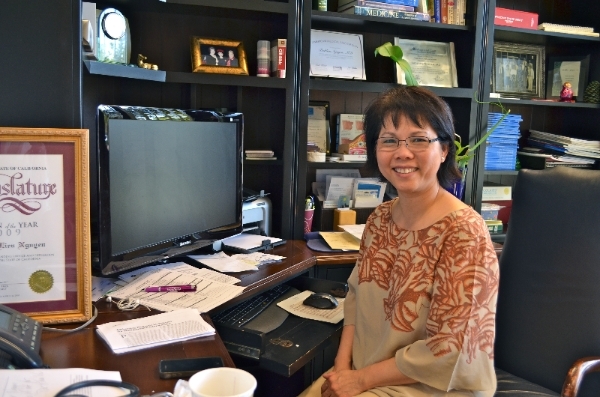 *About the Authors: Thuy Vo Dang, is the Archivist for the UCI Libraries Orange County & Southeast Asian Archive Center, Linda Trinh Vo is a professor in the Department of Asian American Studies and director of the Vietnamese American Oral History Project at UC Irvine and Tram Le is the associate director of the Vietnamese American Oral History Project at UC Irvine. Vo and Le are co-curators and co-directors of the VIETNAMESE FOCUS: GENERATIONS OF STORIES exhibition.